The approval of using insect protein for poultry feed can be expected in the not so distant future. This is according to Tarique Arsiwalla, chief commercial officer at insect producer Protix in the Netherlands and board member of the International Platform of Insects for Food and Feed (IPIFF). The feeding of insect meal to farm animals is currently not allowed in the European Union. It is allowed for farmed fish and pet food. Live insects and insect oil are allowed to be fed to farm animals. For example, insect oil is already processed in piglet feed. The insect sector is moving fast, fuelled by the approval to use insect protein in aquafeed in 2017, and now we are ready for the next step: approval of insect meal for poultry diets”, says Arsiwalla. Considering the global scale of the poultry sector, the opportunities for companies like Protix are enormous. “The first drafts are being prepared right now, and with voting and actual implementation period taken into account, I expect that approval can be expected soon”, says Arsiwalla. He also addresses that the change in legislation will most likely be linked with the approval of meat and bone meal (pigs) for poultry diets. “The insect sector is moving fast, fuelled by the approval to use insect protein in aquafeed in 2017, and now we are ready for the next step: approval of insect meal for poultry diets,” says Arsiwalla. Protix tries to turn insects into products for consumers to improve the visibility and acceptance of using insects in the feed and food chain. In the Netherlands, this has led to the introduction of Oerei (ancient egg) from layer hens fed on live insect larvae. These eggs are sold in the largest supermarket chain in the Netherlands, who will step up the number of sales outlets as of week 40, thanks to high demand for these types of eggs. On a European level, Protix has introduced the Friendly Salmon, farmed salmon fed on insect meal. Soon, the Dutch company will also introduce the Friendly Trout. 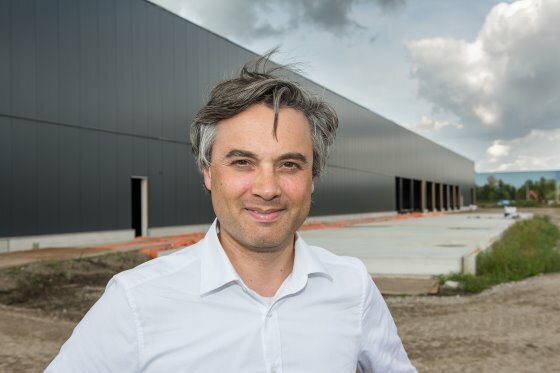 Last Friday, Protix celebrated the highest point reached in the construction of its new insect production facility in Bergen op Zoom, in the south of the Netherlands. A large part of the last funding has been used to finance this production facility. This multi-million dollar facility is the second facility for Protix and marks the change that is seen in the global insect sector. “This is a true demand-driven investment”. The volumes that we will produce here are largely pre-sold already in term contracts for the coming years for our existing and some new customers. Luckily, we can expand on the same location, so we can serve more clients in new markets in the near future. This will then also entail new clients that will use the insect meal for poultry diets, as soon as this is approved by Brussels,” Arsiwalla concludes.